Back in May, Google AdWords announced that more Google searches are now being performed on mobile devices than on desktop computers — this statement was reaffirmed by Amit Singhal earlier this month. Following the initial announcement, Google launched their Micro Moments campaign, which entreated agencies to consider “winning the moment,” for their client’s customers. Moreover, the campaign put forward the extremely bold idea that, “the purchase funnel is dead.” So what, exactly, is the connection between the two? While the amount of time spent on mobile devices continues to grow, mobile activity itself has become increasingly unbalanced. A recently updated annual study by Yahoo & Flurry found that browser-based activity only accounts for about 10% of mobile usage, while users spend the remaining 90% of their time using apps. While this probably won’t come as news to most of you, recent comments from Simon Khalaf, Yahoo’s Senior VP of Publishing, indicate an interesting philosophical shift in how the digital industry is responding to the emergent data on mobile behavior. The disparaging description of search engines as merely being lists of “10 blue links” is an age-old slight against Google, first conceived as a positioning statement to set Bing’s “Decision Engine” apart at the time of its launch. Nonetheless, there now seems to be plenty of strong indicators confirming that web browser usage is on the decline, regardless of the device or user demographic. As Greg Sterling aptly pointed out on Marketing Land, the implication is that this represents a threat to search. Similarly, writing for Search Engine Watch, YuYu Chen asked if this could ultimately be a threat to SEO as well. It’s a fair question, especially considering that a threat to Google’s primary source of revenue — i.e. paid search — could pose a serious threat to organic search marketing strategies too. So Who Cares If Mobile Browser Usage Is Down? But don’t freak out just yet — this isn’t Mobilegeddon. Just as Bing’s Decision Engine didn’t kill Google’s Search Engine, SEO isn’t going to be dead anytime soon. In fact, at SMX, ComScore’s Eli Goodman presented data that projected a very bright future for publishers on the mobile web. In his presentation, Goodman explained that iOS was driving growth on mobile searches in general and that mobile web properties were much more successful than mobile apps when it came to reaching unique visitors. The primary factor behind mobile publishers’ ongoing success is that the linking infrastructure between mobile properties is simply easier to execute, more powerful, and visible to users. BIAKelsey’s Michael Boland published an excellent video recently which fleshes out the discussion. In his discussion on the Future of Search, Boland envisions an app-based future that, “doesn’t compel a search engine, as we know it.” Or, put another way, doesn’t compel the “10 blue links” model of web-based engagement. The video neatly illustrates the current state of the broken purchase funnel experience. Using the example of organizing a night out at a local event, the video illustrates how a user must flip back and forth between all manners of different app and browser-based experiences to achieve their ultimate goal. The video is a must watch — Boland makes a compelling observation that is simultaneously the complement and the counter to Goodman’s argument the linking infrastructure of the mobile web is the primary factor in its success (over apps). Boland quickly shows how the mobile web is essentially disjointed between many different properties and, therefore, does not generate the comparably fluid, on demand consumer experiences available in apps. The customer purchase funnel doesn’t get any more fragmented than this! Moreover, Boland takes the argument in a radical new direction, highlighting how companies like Verve and One Button are trying to solve the problem of inter-app linking to restore the broken links in the chain. He says that Google is also trying to improve the deep linking functionality between the mobile web and apps through full app indexing, and the links between apps and apps through Google’s Now On Tap. However, at the end of the video Boland suggests that the biggest driver of app indexing (or at least the standards around the visibility of the internal pages of an app) will likely come from Apple’s new Force Touch mechanism on their latest 6S devices. Amit Singhal confirmed the progress on Google’s app indexing efforts earlier this month at Recode’s Mobile conference, stating that they had already indexed over 100 billion pages from within native apps. In the same article, Recode’s Mark Bergen goes on to talk about investor insecurity in regards to Google’s mobile revenue numbers and, echoing Boland’s thoughts, the emergence of Apple’s own in-app search efforts. But Google’s app indexing efforts are in direct competition with Apple, which is also working on ways to deliver information to iPhone users within and between apps. At face value, the announcement that mobile searches had exceeded desktop, combined with the Micro Moments campaign launch, made it look a bit like Google was simply trying to compete for mobile advertising spend and win some of the dollars invested in Facebook ads. Much of Boland’s report hits upon the same notes that are often heard in the most cynical of marketing camps. The theory is that Mobilegeddon was designed for Google to make the mobile web more attractive, and paid search is the solution for those unable to design their sites to rank well on mobile. But that theory doesn’t hold much water, mainly because the sites that don’t work well on mobile aren’t going to work well on paid search anyway. So, in light of Singhal’s announcement that 100 billion app pages were indexed, we see the flipside of the Micro Moments campaign revealed, foreshadowing an even greater existential threat to Google’s core advertising business from mobile apps. By declaring, “the purchase funnel is dead,” Google was not expounding yet another, “SEO is Dead,” marketing theory to win big brand PPC budgets — rather, it represented the true call of the canary in the coalmine for the link-based marketplace. Time lost by mobile browsers to web apps is just the metaphorical tip of the iceberg. In-app searches pose an emerging threat to Google’s future (search being their primary source of revenue), and what’s at stake is not simply a matter of time lost, but the erosion of the fundamental, structural foundations of the organization of information on the web. Point is, any threat to Google is also a threat to every business that relies on Google as their front door. Seasoned SEOs who have battled both penguins and pandas know that social media marketing never ended up being the audience development powerhouse that the wild west of search once was. If “10 blue links” aren’t going to be the front door or mediator between consumers and products anymore, then the future becomes increasingly unclear — where will the lion’s share of digital marketing take place? What we’ve already seen is that screen estate on mobile search leads to a winner-takes-all distribution — one that is even more pronounced than on desktop (which has the same distribution). This means that we’re going to see less and less value in ranking anywhere below the first page of results. It’s safe to assume that the only worthwhile spots will be top ad positions and anything just below the OneBox results. Programmatic ad networks are probably wringing their hands with glee right now as, post-search, they would seem have got the major marketplaces sewn up (content publishers and social audiences). With less screen estate on mobile devices, Google may have a captive market at the top of search results, but the overall utility of its software is greatly diminished. It also means that where the information archive was once effectively a free-for-all campaign map to be augmented with paid search, we will begin see an even more heavily curated set of results. What’s clear is that the brands with the biggest PPC budgets and programmatic capabilities will quickly rise to the top. In many ways, this has already happened. The semi-predictive nature of Google Instant was seemingly proof that the search engine officially knew everything. But it’s all an illusion! Google’s web crawler may have a trillion pages in its sites, but, as Mike Grehan has said countless times for years, all of the pages that make up the ranking web represent a mere fraction of the entire database. Talking to Aaron Wall on SEOBook in 2009, Grehan said, “Google is saying they now have seen a trillion URLs and have no certainty that they’ll ever be able to crawl them in a timely fashion, maybe we’ve reached the zenith of the crawl.” In other words, it’s not that Google “knows everything” — rather, it has a better idea of what is worth searching and what isn’t. In a post-Panda and post-Penguin world, Google’s search results are simply a corpus of the web, rather than an index of the entire thing. That means that Google already more closely resembles an app more than it does a browser. In fact, this has been the case for a number of years. One could argue that this resemblance might account for the decline in mobile browser usage itself — although doing so would probably be a losing battle. What Does All This Mean for SEO and SEM? For starters, it means the fundamental nature of the link graph has already changed, is currently still mutating, and will continue to transform significantly over the next 5-10 years. Yes, Goodman’s arguments that the mobile web isn’t going anywhere and that it offers the strongest strategic advantage through its current ability to link assets together may have some value, but my impression is that all the signs point to inter-app linking, restructuring, and disintermediating the entire knowledge economy as reflected in the web, and as interpreted by search engines. Hot button marketing and advertising industry issues such as “Mobilegeddon” and “Ad Blocking” have made it clear that the mobile web has reached the point of stagnation. Currently, all of the innovation is being focused on the internal visibility of apps, the upshot of which will inevitably be inter-app linking. And we all know what the impact of links has been on search engines in the last 15 years. The parallel vision and insight that emerges from between the lines in both Goodman and Boland’s reports is this: regardless of how you do it, the ability to link assets together is far and away the biggest driver of success on the mobile platform. Moreover, the less friction involved in the creation of those links, the better the chance that you will, in fact, succeed. The good news is that whatever linking theory you subscribe to (i.e., mobile web or inter-app), the evidence suggests that in order to succeed on mobile, you just need more pages indexed in search. However, if you can afford to think like a media buyer and triangulate your brand across a plethora of intent signals, it’s probably not a bad idea. In the short term, there really do seem to be some huge, winner-takes-all mobile marketing opportunities for those who can fully translate the desktop consumer experience onto the mobile platform. The bad news is that even if you want to get out ahead, long-term project planning is tricky because the app experience itself is fragmenting. Apps are no longer just for mobile phones — they’re now popping up in all sorts of interesting places, including TVs, game consoles, thermostats, bathroom scales, electric toothbrushes, sneakers and dog collars. 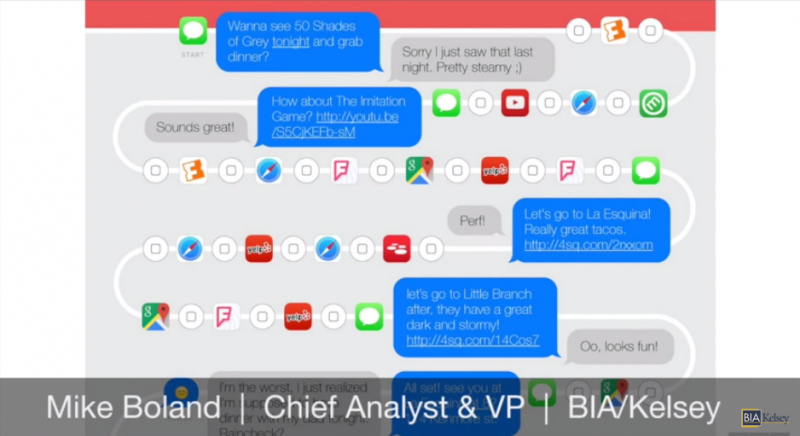 There are even apps within apps, like Slack, Trello, and Gmail. And they’ll soon spread to self-driving cars, drones, fridges, smart clothes and smart mirrors. Informationally-oriented linking created concepts such as hubs and authorities, Instant Answers and the knowledge graph did a good job of translating the search experience from desktop to mobile, but those concepts are reaching their limits in a purely app based information ecosystem. In-app linking will likely lead to a more transaction-based, information architecture across the entire web. The web’s role as an information archive is going to lose ground to the concept of the web as an intent map, and the direction of user experience will change from one of pull, to push. With that in mind, I have to agree with Boland’s postulation that Force Touch will be a deciding factor in the immediate future of search (that is to say, the shortest of the longer-term view). Apple’s Force Touch arguably creates as big an incentive for developers to expose the internal pages of apps, rethink conversion points within the consumer journey, and find ways to shorten it, as visibility does in Google Search. These kinds of open data points represent a return to the original organic strategies of desktop search marketing, and just need to be adapted for a mobile-centric user experience. Exposing the internal pages of the app won’t just assist search indexing but provide an opportunity to rethink conversion points across a user decision journey that spans multiple apps and find ways to shorten it. That exposition process alone is going to make it easier for all app developers and/or digital marketers to identify common audience intersection points between apps. I wish I could say this in plainer english, but for me, all of this points to the app-storification of search engines, native intent-based interoperability, and programmatically personalized interaction design. Nonetheless, the dummy marketer move at this moment would be assuming that the issue is purely technology and device-related one. In reality, the problem is people. Luckily, we know where all of that lost time is spent and where the lost links are found, just as Google does. Simply put, it’s all in apps. People’s technology habits are changing from desktop-focused to mobile-centric. Dual trends of search indexes and web publishers consolidating properties into apps is causing link diversity to erode, which is the primary digital design factor in organizing information. What this means is that the purchasing funnel isn’t dead, per se. Rather, it’s incredibly fragmented across increasingly complex technological conduits, which is likely to increase the cost of marketing. And even if you have all the budget in the world, the real deciding factor will be imagination, as even Google can’t fully connect the dots. So, now that you have all of the necessary information, how are you going to connect it all together? Jonathan Allen is the President of Longneck & Thunderfoot, a brand publishing company which is part of the Columbia Startup Lab, an incubator program based in New York City. He is also formerly the Director of Search Engine Watch (2009-2013), one of the longest running news publications on the search engine marketing industry. Are we really better off becoming publishers?